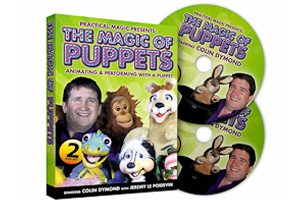 Colin Dymond’s DVD sold around the wold to puppeteers and children’s entertainers. 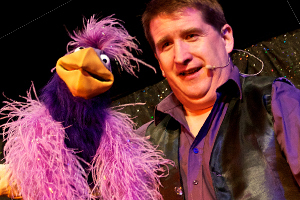 As one of the few professional ventriloquists in the country Colin has a cast of puppet friends to choose from. Let him know if there is a particular friend you’d like to see at your event. 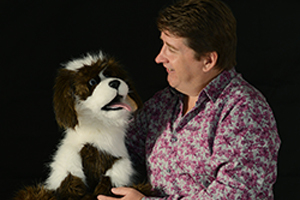 A featured performer at Vent Haven, the worlds largest ventriloquist convention. Colin was chosen by the discovery channel to explain the science of ventriloquism, he also has a DVD teaching magicians how to get the most magic from their puppet. 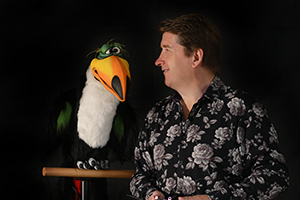 Colin we also be lecturing at Venterama, the first UK ventriloquist convention. Sir Nigel of Trelwaney, Snot the Dragon to his friends comes to most of Colin’s shows. He is a 50 year old dragon but because Dragons live to well over 300 years old at 50 he is still just a child. The star of every show! Carlos is a south American Toucan or is it Two-Can he has an identical twin. Parrots can live to be over one hundred years old and in that time you can teach them how to say a few words and do a few tricks. See what tricks Lolly has to show you. A playful purple parrot puppet! No one seams to know exactly what snowball is, we think she’s a girl but… Maybe just a purple kissy machine! 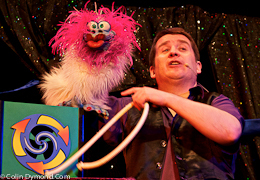 A crazy puppet with plenty of magic tricks. 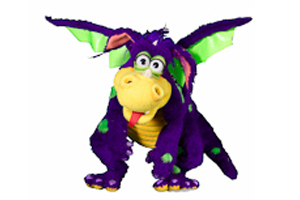 New puppets are being added all the time so keep an eye on the web site to keep you up to date. It’s never too early too book! Check availability now!